What can I say I am completely in love with it!! The tan goes on amazing it has lasted me about 6 days and it’s still perfect after every shower & moisturising.. there was no strong smell from the tan which I love so much about it! I use the 12% spray solution and it sprayed so gorgeous and even. Luxe gold is my new favourite as it gives me the perfect golden tan I am naturally pale and this gives me that sun kissed glow & colour every girl needs in there life!! It’s a game changer for me and I honestly wouldn’t talk or recommend any product that I didn’t like or didn’t suit me! But this tan is simply amazing and one I will always have In my home & salon.. because if it’s good for me it’s good for my clients I always provide the best top quality for my salon & clients and this tan is top quality in my eyes! I love the fact this tan was made for all skin types which just makes it even more amazing that anyone can wear it and have the same flawless outcome! I have been in the beauty industry 14 years now and within this time I have tried numerous amounts of spray tan brands. I always found that they either have a unpleasant smell or the wear off isn't great. I wanted to try the new Luxe Gold tan as I always love trying new products. As soon as I opened the bottle the scent was gorgeous very similar to baby powder! I noticed that it dried in quite quickly to my skin and I wasn't feeling sticky all evening after application. The next day I showered and the colour of the tan was beautiful. A very natural golden tone. No orange look at all and almost gave me like a sun kissed glow as well. I moisturised every night before bed and was always waiting on that 'scaley', patchy look to appear but nothing appeared. The tan just gradually faded and it lasted me a whole week before I applied it again. I am recommending this tan to all my clients now as I am very confident that everyone will love it as much as me! 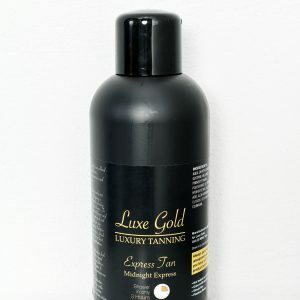 Luxe Gold is a New Tan created and based in Ireland. Our luxury range provides Premium high quality ingredients & free from parabens & alcohol so we can ensure it lets the needs of 98% of skin types. Luxe Golds wide range of products provides you with the choice of either a professional salon spray tan or a luxurious product to use at home. May it be a perfect glow you are aiming for or the deepest, darkest bronze we have you covered. All of our products are designed to leave your skin feeling fresh and ready for any occasion with our scented baby powered fragrance. Our inspiration comes from one of our founders having psoriasis, as well as demands of consumers for a tan that suits even those of us who may not have the perfect skin and lets be honest we have all suffered at some stage with not so perfect skin! While creating this tanning range we worked closely with women who suffer from skin conditions and also those free of any to enable us to create a genuinely unique luxury range to tan and pamper & nourish the skin. Our commitment to our clients, is to provide ‘hands on’ and ‘practical’ help and advice to each and every client, no matter what size or stage of their business cycle they may be at, in a cost effective and highly professional manner.